Most hated tv through the eras. Ty Pennington: Ripping down someone's house is fantastic fun! I watch this show for three reasons. 1) All the crew loves the families and really want to help them. Which is totally cool, because I believe all the families deserve it. 2) I love watching the house transform and I love seeing the families faces when they come home to a brand new house. 3) Ty takes off his shirt in a lot of episodes. How could you not want to see Ty without a shirt on? 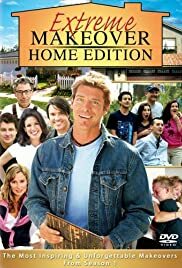 (unless your a guy of course) Also, if you like this show you should watch the new one called "Extreme Makeover Home Edition: How'd They Do That?" they show a lot of stuff that the original one didn't. It's really cool!